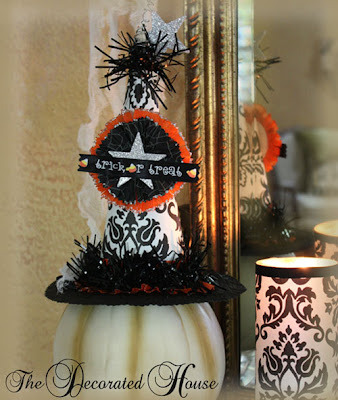 No matter what style you like to decorate with, Halloween is just plain fun. What other holiday gives everyone the OK to be mischievously like a kid again? When doing your own decorating for this fun holiday, you can go in any direction you wish. It can be a bit scary and ghoulish, which I've seen Martha Stewart do very well, or it can be a bit elegant and whimsical. The best place to start is by looking around your own haunted mansion, or your sweet little cottage, and find things you already have to embellish and build upon. What do you do you see that you can transform into something else, or add a few touches to make it a part of the season? Old jars, books, fabric, paper, photos, etc., and I bet you can think of a bunch more! Think of new ways to display your old decorations with some new (old) things you have somewhere else in the house. Since I've been using black and white and damask for a long time, it was the perfect way to start my Halloween decor. And I still have no sofa in the living room and that room remains in the "meantime" stage, I almost skipped doing anything on the entry table. But I missed not having the fun of doing something to usher in the holiday. So the entry table and mantel will have be about all that is decorated this year. And a little bit outside, of course. I need to see a smiling Jack O Lantern on the porch, too. I'll continue to post a few little peeks until the Halloween Blog Parties begin. 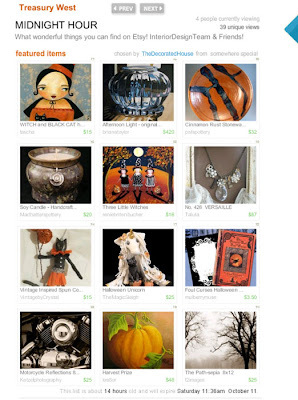 This treasury has ended, but you can find some beautiful things on Etsy by searching "interiordesignteam" or "cssteam"
Love the hat on the pumpkin! If I decorated for Halloween that's exactly the type thing I would want! I have totally been away from blogland too long! I adore the 'pumpkin' hat! Hi Donna! I'm so enjoying all of your Halloween creations, and I think that you captured exactly what makes it special...the childlike-fun that it provides. I just love this time of year. Donners, the hat is adorable! I love that!! Next time I cannot sleep I'm gonna follow your lead and search ETSY for all those pretties. Everything I see is so wonderful! I love the wicked photos! How Fun!